I know pretty much all there is to know about the form I-9 and how to complete it, how not to complete it, acceptable id’s, unacceptable id’s, fake id’s and what errors are okay and what errors are not. I can even recite some of the 70 (formerly 69 page) I-9 handbook from memory. I didn’t do it on purpose and I often catch slack from my HR buddies when I correct something that doesn’t seem like a big deal to them. This knowledge came from 7 years of staffing industry experience. When you hire anywhere from 20-150 employees a week you have to learn in-processing up and down, forwards and backwards or you’ll get into a mess quick. The I-9 is not my favorite form, it’s kind of annoying. It’s stupid to have to do E-verify and the I-9, one or the other government. One. Or. The. Other. Anyway, I don’t love it so my knowledge of the I-9 isn’t because I think it’s the best thing ever, but because I had to complete multiple I-9’s a day. You may not like all the rules of the I-9, but life will be a lot easier if you just follow them. 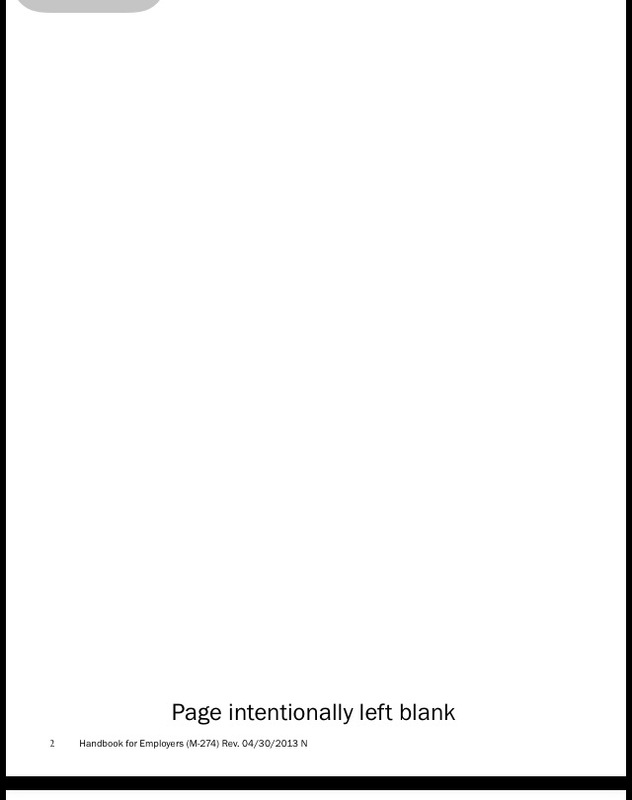 What is a handbook without an intentional blank page? 1) If you didn’t see those id’s DO NOT SIGN that form. It is not okay to have someone fax you their documents from a remote location and you sign off that you took their id’s. Have someone else that works at that location take their id’s and complete the form. Do not complicate this process. It is the simplest step of all. 2) Do not assume that they filled out their application correctly and their I-9 incorrectly. Use the social they put on their I-9. If you notice it while you are taking their documentation have them correct it. Do not correct what the employee puts on the I-9. 3) Do not assume they are a U.S. Citizen if they skipped this step. I don’t care if their application says they are or not, this section is not for you to complete. 4) When you make a mistake on the I-9 it is okay to correct it. The easiest way to correct it is to draw a line through the mistake and initial it. If you must use white-out be sure to attach a piece of paper explaining the correction you did. Sign and date it and all that jazz. Don’t be ridiculous. You can document corrections, it’s better than lying. 5) You have to keep I-9s for the entire employment of an employee. When an employee is no longer employed you will choose the date to shred the I-9 by this formula: 3 years after the HIRE date or 1 year after the TERM date. There is even a nice little reference guide for you to use on page 27 of the I-9 handbook. Do NOT keep the I-9 one day longer than necessary. If you have any kind of question at all about the I-9 feel free to ask. I could write a book on what to do and what not to do. It would probably be 70 pages. Someone else already did that, so either read the book or seek me out. Don’t mess with the big bad I-9. Next Next post: Won’t you be my… friend?